A couple of months ago, Cosmopolitan announced the launch of the Middle Eastern version of the best selling women’s magazine. 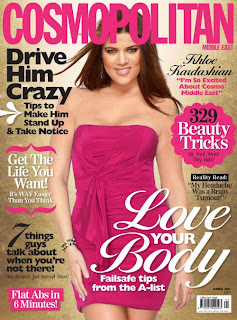 On April 1st, the magazine finally debuted with Kardashian sister, Khloe on its first cover, wearing a cute pink dress. Inside the issue, Khloe gives a very candid interview. She opens up about “dealing with the Kardashian body image,” constantly being compared to her older sisters, and her marriage to Lamar Odom. The news of the launch about a ME-Cosmo came with a bit of criticism. Some believe that the region, which is home to many women who don’t have much rights or a voice, might not be ready to have its own Cosmo. Others believe that the region is changing and the launch of the magazine is something women should be happy about. I think that this is a great idea!~!